that it was “nonsense” that the DEA was “going to threaten doctors simply for discussing the pros and cons of using marijuana with their patients” until the Ninth Circuit held that such a restriction was unconstitutional. QUESTIONER: …[W]hy not just legalize drugs? Former Drug Czar, General BARRY MCCAFFREY (retired): …[S]ince I’m not in public life, [I can say] I actually don’t care. I care about 6th graders through 12th graders. If you’re 40 years old, and you’re living in Oregon, and you have 12 giant pot plants in the back of your log cabin, knock yourself out. Yet despite the fact that he claims marijuana is de facto legalized and that he secretly didn’t care if it was legalized, under his leadership as drug czar continuing through his successor’s term, arrests for mere marijuana possession went way up [pdf] – and not just for large amounts as he suggests here. 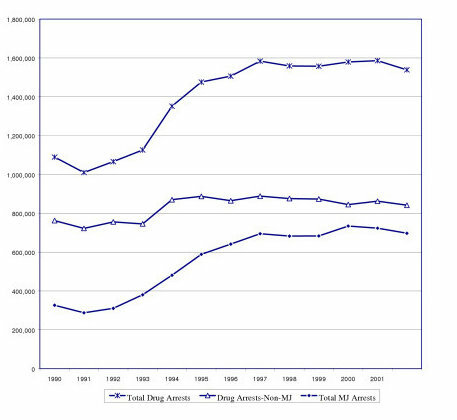 Yet arrests related to marijuana surpassed that of both heroin and cocaine in McCaffrey’s first year as drug czar – and almost matched that of all non-marijuana-related drug offenses. According to a study by Ryan S King and Marc Mauer [pdf], “Marijuana arrests increased by 113% between 1990 and 2002, while overall arrests decreased by 3%” – and the bulk of these arrests (over 50%) were of small users. On top of it all, he now claims to have not even opposed the legalization of marijuana as he supervised the War on Marijuana.